An El Niño event is predicted to occur in December according to eight different international climate models. At the beginning of December, seas surface temperatures were above the El Niño threshold, but the atmosphere thresholds for El Niño were neutral meaning an El Niño had not officially occurred. 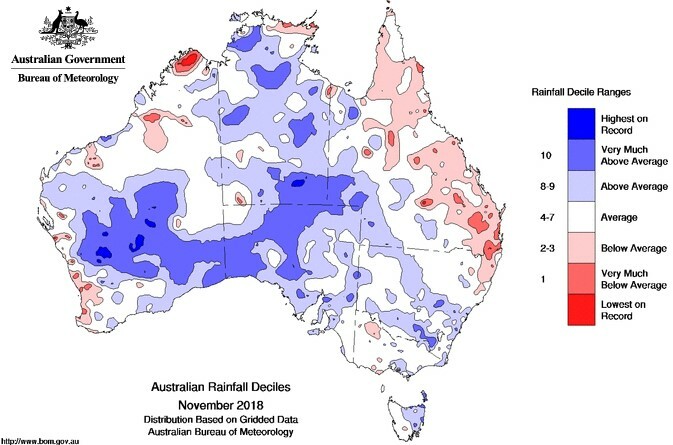 Historically, an El Niño at this time of year corresponds to drier than average conditions in northern Australia but has less impact on rainfall in the south. The Indian Ocean Dipole, which influences climate over western and southern Australia, is predicted to return to neutral in early summer following a brief positive phase. This positive IOD occurred too late in the season to greatly influence conditions. The east coast is showing above normal fire potential as well as parts of South Australia and Western Australia. 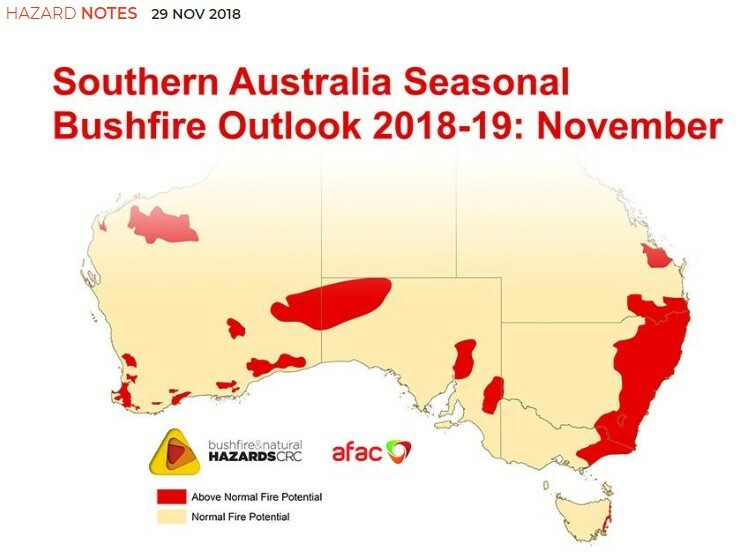 For Tasmania the above normal fire potential zone stretches most of the east coast. 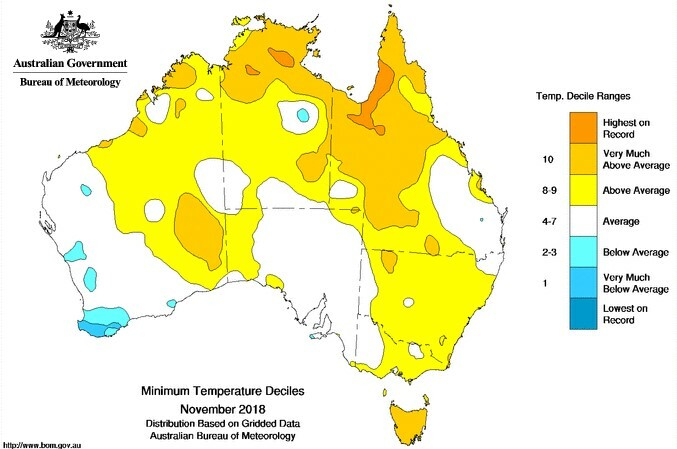 November offered some reprieve from dry conditions with areas in the west and central Australia receiving above average rainfall. The last three-month deciles in figure 2 show that conditions are still dry for large areas of the east coast, and especially dry in the key grain growing regions of Western Australia, South Australia and the majority of Victoria and Tasmania. Figure 1. Rainfall deciles for November 2018. Figure 2. 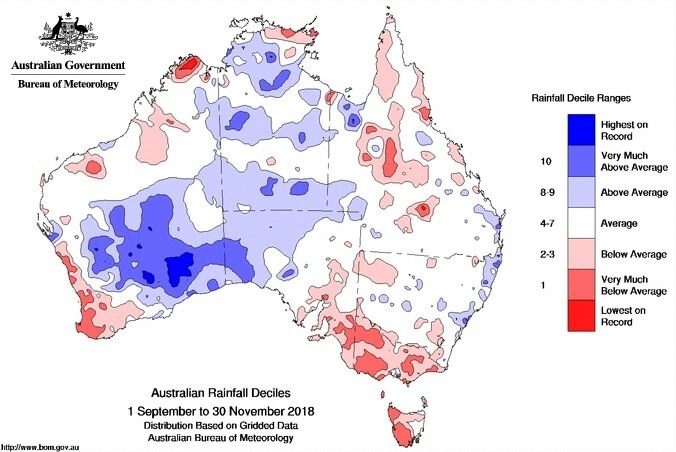 Rainfall deciles for September to November 2018. Most of Queensland, northern Western Australia and parts of the Northern Territory are predicted to have below average rainfall this summer. The remainder of the country can expect average conditions with small pockets on the southern SA/WA border, the Eyre Peninsula and the NSW/VIC border predicting above average rainfall. The outlook for December specifically, shows areas of central and south eastern Australia receiving above average rainfall. Conditions looks particularly dry for north-west WA and pockets of QLD and the NT. Figure 3. 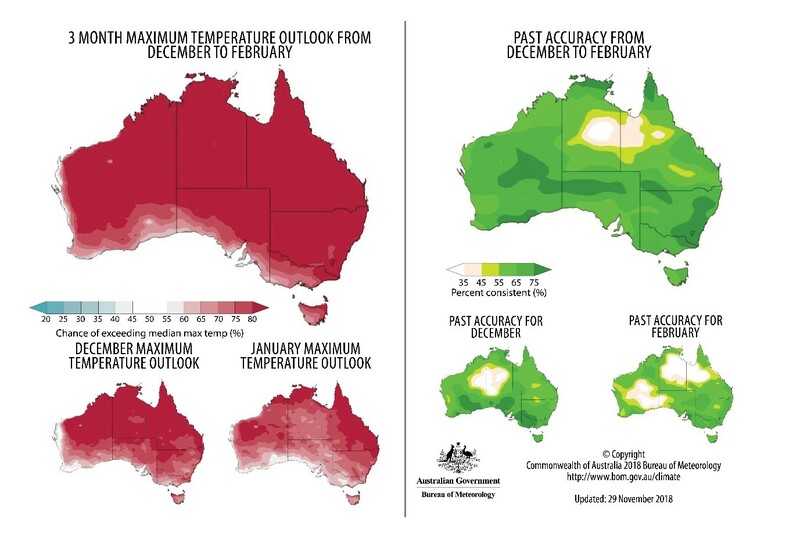 Australian outlook for December to February 2018. Figure 4. 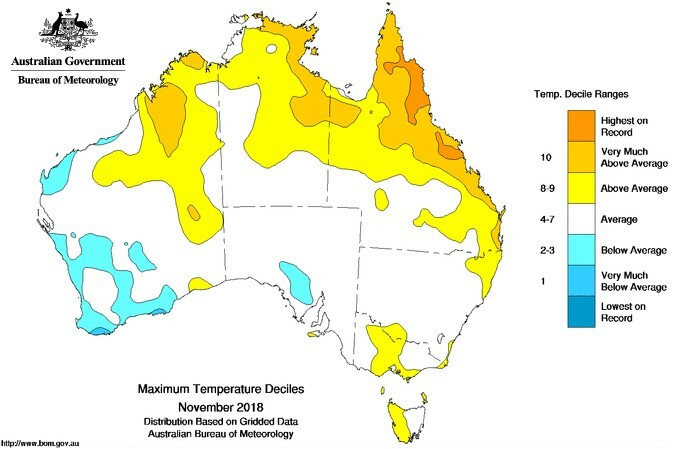 Maximum temperature deciles for November 2018. Figure 5. Minimum temperature deciles for November 2018. Forecasts suggest the whole country will experience above average maximum temperatures over summer. Figure 6. December to February maximum temperature outlook. Minimum temperatures are also forecast to be average to above average, except for parts of coastal Western Australia where below average to average minimum temperatures are predicted. Figure 7. December to February minimum temperature outlook.